Lake Sai Park Forest of Wild Bird (西湖野鳥の森公園, saikoyachonomorikouen) is a park located west side of Lake Sai. In this park, you can enjoy bird watching all though the year. It has also great view of Mt. Fuji. There is a restaurant and gallery where also you can enjoy bird watching from warm room in winter. 1. use Saiko Aokigahara retoro bus to Saikoyachonomorikouen. Facility opens: from 9:00 to 17:00. 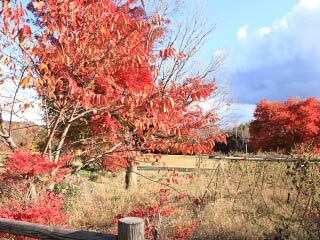 It has a beautiful Koyo in the beginning of November.